Are you a 2019 high school graduate? If you answered yes to both of these questions, you qualify for the Missouri Plus Scholarship! A $3520* Scholarship is waiting for you at JWCC. Just sign up it's that easy. Study & Work Time – No Class on Fridays! *$3520 for students taking 32 credit hours in an academic year based on 2018-2019 out-of-district rate. 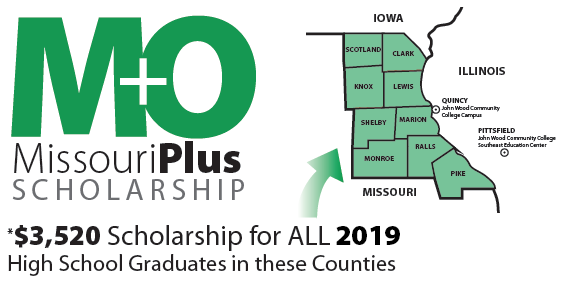 Students taking more or less than 32 credit hours will receive $110 scholarship per credit hour taken based on 2018-2019 out-of-district rate. Scholarship does not apply to online classes. Students enrolling at JWCC within one year of high school graduation above will qualify.